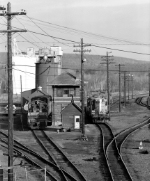 Title: B&M local at Whitefield, NH. 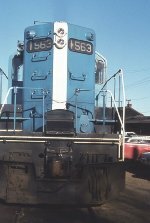 Description: Shortly after RY-2 had left town, a B&M local came through with GP-7 1563 up front. 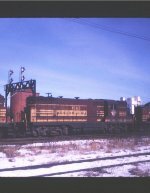 Description: 1563 and 1542 idle in their stalls at Boston Engine Terminal. Description: With the closing of Westboro Engine Terminal across the river, all motive power is now based out behind the passenger station. 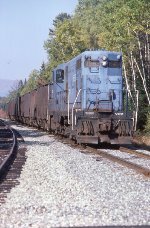 Description: Boston & Maine Railroad GP7 1563 at South Portland, Maine on an unknown day in September 1981, Kodachrome by Chuck Zeiler. Description: After dropping his cars at the east end of the yard, CPSP's power returns to the west end, but will have to wait a couple of minutes for a tamper, which has also just come from the east end. 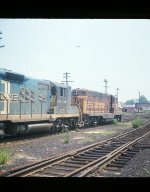 Description: CPSP's power waits while the tamper makes a reverse move at the "45" switch to go to the house. 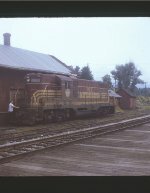 Description: The tamper heads for the house and CPSP starts his move. Description: CPSP's power heading for the "monkey crossover". He'll then reverse his move and head for the pit. Description: CPSP traversing the "monkey crossover". Description: after reversing through the "monkey crossover", CPSP heads for the pit to drop a couple of units, which he won't need for the smaller train he'll take to Springfield. Description: B&M power on MBTA trains - DATE UNKNOWN - photo by Bill Briggs.